Wonderful location, with long views down an interesting coastline, of course the Benefit of a pool which was not small and either no chlorine or very little and immaculately clean was wonderful contrast to staying in the town at the beautiful Argostoli. Stayed for one night before going to villa and it was spotless and Irene couldn’t have been nicer . wonderful location with a stunning view over the bay. family run and it really shows in the warmth Mrs Garbis and her family show to all guests. we have stayed here 3 times now, so they must be doing something right. Everything from the moment we arrived. The amazing views, quiet, secure location and to have the owner staying there too keeping her eye on things and making sure everything was 'ship shape' made all the difference. - The pool area with sea view is just amazing. - Separate bedroom from the kitchen and bathroom - Comfortable mattresses and decent pillows. - Very good room temperature, we didn't need to use the air conditioning which during the summer is a big advantage - Large terrace in front of the studio and near to the pool - Large private parking area - Pool bar - The payment was done through booking, no need to pay in cash. Lovely host, great location overlooking the sea and beautiful large pool. Very clean (apartment cleaned every day). Panos, the son of the lady owner, was always very kind and helpful. Garbis Villas is a collection of superb, bright, clean accommodation set around a lovely pool with the back drop of beautiful blue sea. The owner Irene was welcoming and friendly without being intrusive. It’s set back slightly from the main village, so is peaceful, but an easy walk to lots of great restaurants. The rooms were cleaned daily and all our needs were well catered from pool towels and even beach umbrellas to borrow. Lock in a great price for Garbis Villas & Apartments - rated 9.2 by recent guests. One of our top picks in Lourdhata.Located in Lourdata Village, Garbis Villas & Apartments is located is 550 yards from the beach, taverns and a mini market. It boasts an outdoor pool and spacious accommodation with views of the pool and Loudras Beach. Featuring a terrace or balcony, all accommodation types have a kitchen or kitchenette. They all have air conditioning, a small dining table, safe and TV. Garbis Villas is a 20-minute drive from the lively village of Argostoli. Free Wi-Fi access is available in public areas of the property. Kefalonia Airport is at a distance of 12.4 miles. Private parking is provided on site. Garbis Villas & Apartments has been welcoming Booking.com guests since 5 Oct 2012. 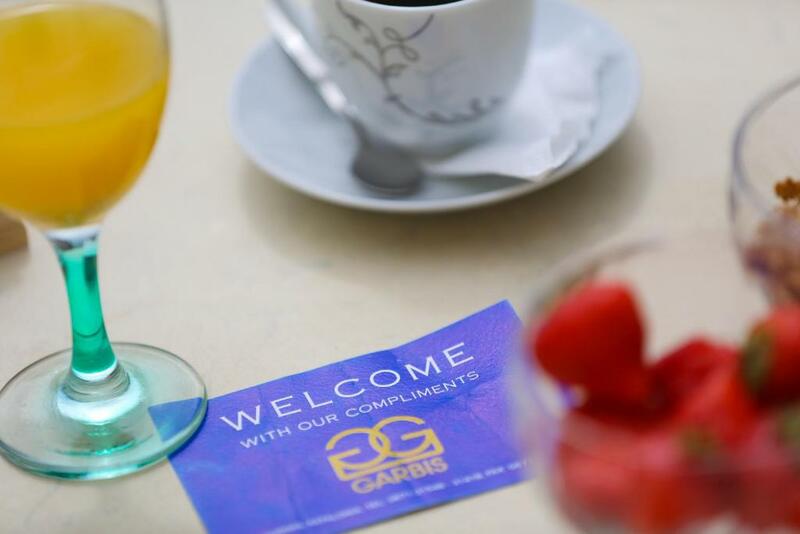 When would you like to stay at Garbis Villas & Apartments? Offering a terrace or balcony with views of the pool and Ionian Sea, this air-conditioned studio offers a kitchenette with fridge, coffee-tea-facilities and cooking hobs. A small dining table, safe and TV are also included. Offering a terrace or balcony with views of the pool and Ionian Sea, this air-conditioned apartment offers a fully equipped kitchen, a small dining table and seating area. A safe and TV are also included. This apartment features a stovetop, tile/marble floor and electric kettle. This studio features a stovetop, air conditioning and view. House rules Garbis Villas & Apartments takes special requests - add in the next step! Garbis Villas &amp; Apartments accepts these cards and reserves the right to temporarily hold an amount prior to arrival. Garbis Villas & Apartments accepts these cards and reserves the right to temporarily hold an amount prior to arrival. Please inform Garbis Villas & Apartments in advance of your expected arrival time. You can use the Special Requests box when booking, or contact the property directly with the contact details provided in your confirmation. Very friendly, easy-going hosts, very clean and spacious apartment. We didn’t use the kitchen though as there were great and authentic tavernas around (a few min walk). We had a super relaxing stay and enjoyed our time. Pieter (the son of the family) gave us great tips, we had a beer and chat with him around the pool - would love to stay here again! You can walk to the beach (10 min via a steep trail or 20 min by a calm street that connects the beach to the rest or the island) or rent a scooter or car (there are several places around the village). Very nice family run villas. Great accommodations, pool,bar/cafe,view ,location and staff. Pete made us a great breakfast and Irene very sweet. During the summer, the air conditioning wasn't enough, so we needed to turn on the fan as well. Staff, pool and view were great! Lots of back and forth via e-mail and on the phone relating to the payment could have been avoided if there was a credit card reader at the resort office. Very beautiful setting, large rooms, aircon was amazing, and it was very hot. Staff very friendly.